This tutorial covers how to get Instagram notifications on PC for any of your Instagram posts liked and commented by someone. Instagram web app is good enough to browse feed, access your Instagram profile, check notifications, etc. However, the thing is it doesn’t provide desktop notification when any of your Instagram follower or user like a pic/post or comment on your pic. Still, it is possible to do. For this, you will need Chrome browser and a free extension. To receive desktop alerts for new likes and comments on your Instagram posts, I have used “WebClient for Instagram” Chrome extension. 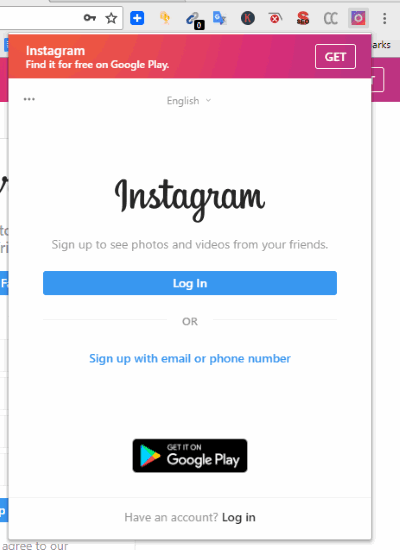 Once installed, you can open its pop-up window using the extension icon, sign in to your Instagram account, and then it will start doing the work. 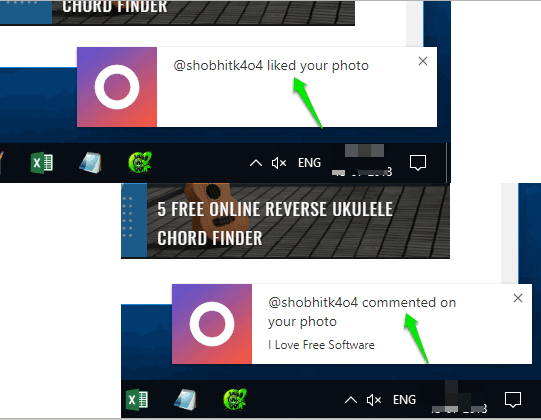 Whenever there is some like or comment on any of your Instagram post, a desktop notification is visible on the bottom right part (just above the system tray) of your PC. In the screenshot above, you can see two Instagram notifications: one for like and another one for comment on my Instagram posts. Note: This extension also comes with feature to receive Instagram notifications when some of your follower adds a new post. But, this feature didn’t work for me. You can try it once to check if it really works. How To Get Instagram Notifications On PC For Post Like and Comment Using This Free Chrome Extension? Step 1: Click on the link that is available at the end of this tutorial and then install this Chrome extension. Step 2: You can see its badge icon on the top right part of Chrome. Now click that badge icon and you will see a pop-up that shows Instagram interface. When the interface is visible, log in to your Instagram account. Step 3: On the pop-up, click the Settings icon, and check if “Notify likes, comments and mentions” option is selected. If yes, that’s well and good. If not, select that option. That’s all! Now you can close the pop-up. Whenever there is some comment and like on your Instagram posts, desktop notifications will be visible for those posts. You will be able to see Instagram username who liked/commented on the post in that pop-up. For comment, it also shows the starting lines of comment in that Instagram notification. Apart from showing Instagram notifications, this extension is also helpful to download Instagram photos and videos and upload photos to your Instagram account. I believe the option to get Instagram notifications on PC for post like and comment must be a built-in feature for Instagram web app. That is not the case though, this Chrome extension is handy to fulfill the purpose. 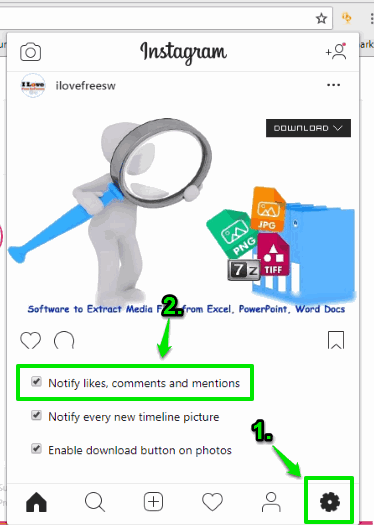 Just install the extension, sign in to your Instagram account, and it will send desktop notifications for likes and comments on your Instagram posts.